Skin care brands in India either talk about how you can become multiple shades ‘lighter’ or 10 years younger. Pond’s new campaign promotes Pond’s White Beauty, a vanishing cream with SPF for sun protection and goes with the communication ‘Perfect Match for your skin’. 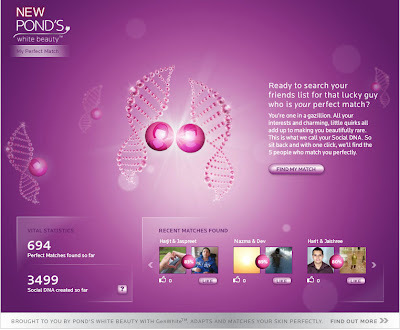 The Facebook Brand Page for Pond’s India hosts a very interesting social matching application called Pond's Perfect Match which sifts through your Facebook friends list, to come up with 5 friends whose ‘social DNA’ matches yours. Its a slick rendition and a good idea, no doubt. Except for the application, the brand page and timeline posts cause serious deja vu. Skin care tips, what to eat, how to keep cool in summers and usual polls – the same content gets recycled on every product brand page nowadays. Even the gratifications. Every contest I see gives out I-pod shuffles! Most of these brand pages seem to run on auto pilot except for a contest or application that gets created during launch. Currently the page has around 167k fans. If not anything else, check out the application. It is well executed. By the way, Pond's also has a nice website, but the media campaign leads to Facebook and except for one hidden link within the application, there is no way to get to the website. A classic case of how a platform has become more important than a fully owned asset.